Climate Change — Keisha Bahr, Ph.D. Climate change is affecting corals on a backdrop of many other anthropogenic stressors such as sedimentation, overfishing, trampling by snorkelers and divers, and nutrient loading. It is important that we understand why some corals species are more susceptible than others to these local and global stressors to gain a better idea of what future reefs may look like. The goals of my research are to provide a framework to model future species composition, abundance, and available habitat for future coral reefs. With these models, scientists, managers, and policy makers can prioritize areas that are subject to the most immediate and dangerous threats and discuss strategies to minimize local and climate change effects in those areas. Previous work has shown ocean warming and acidification reduces coral growth and increases coral bleaching (through the loss of algal symbionts); however, responses are not uniform within and between coral species. This suggests some individuals may not be affected by end-of-century climate change scenarios. To gain a better understanding of the future of coral reefs in Hawaiʻi, I conducted a series of laboratory experiments to determine the relative susceptibility of five abundant species including the endemic finger coral (Porites compressa), lace coral (Pocillopora damicornis), rice coral (Montipora capitata), crust coral (Leptastrea purpurea) and mushroom coral (Fungia scutaria) to future climate change conditions. Overall, I found that ocean warming had a greater negative impact on coral growth compared to ocean acidification. The crust coral showed no detectable response in growth to increased temperatures and acidity, revealing this species may be more resistant to climate change. Ocean acidification also did not appear to effect growth in rice corals. However, the other four coral species all had lower growth rates under ocean warming conditions, and the endemic finger coral was found to be the most susceptible coral species to these climate change stressors. Can corals adapt or acclimatize to warmer waters? As our planet and oceans warm, we wonder can corals keep up? To attempt to answer this question, we replicated the landmark study conducted in the 1970s to determine if there has been any change to coral temperature in the last half century. In the summer of 2017, we replicated the original 1970 experiment using the identical experimental system, methodology, location, species of coral, and even one of the original researchers, Dr. Steve Coles. This provided a very unique opportunity to evaluate whether coral bleaching thresholds have changed over the past 50 years. Differences between the two experiments were dramatic. Results show a substantial increase in coral temperature tolerance. In the three species of Hawaiian corals retested, bleaching occurred later, with higher survivorship and growth rates than corals in 1970. Such dramatic differences in coral bleaching temperature thresholds suggest that corals are either 1) able to change their physiology and/or 2) have undergone natural selection with only the more temperature tolerant corals surviving. Until now, we did not know how long these processes take or if this change can occur at a pace rapid enough to keep up with increasing seawater temperatures. Although these results are encouraging, scientists warn that temperatures are rising faster than corals can change. The slow growth and recruitment of many species of corals, combined with repetitive bleaching events of increasing severity and duration, may lead to catastrophic reductions in coral diversity and abundance. To prevent or even mitigate, this will require reduction in use of fossil fuels and lower emissions of carbon dioxide and other greenhouse gases that are increasing air and seawater temperatures worldwide at an alarming rate. In collaboration with NOAA Coral Reef Ecosystem Program, I am currently assessing the effects of ocean acidification and warming on reef recruitment and biodiversity using Autonomous Reef Monitoring Structures (ARMS). The Hawai‘i Coral Reef Assessment and Monitoring Program (CRAMP) was created during 1997-98 by leading coral reef researchers, managers and educators in Hawai‘i . The initial task was to develop a state-wide network consisting of over 30 long-term coral reef monitoring sites and associated data base. CRAMP is a research program designed to identify the controlling factors, both natural and anthropogenic, contributing to the stability, decline, or recovery of Hawaiian reefs. CRAMP has developed a standard coral reef assessment and monitoring methodology in achieving its goals. 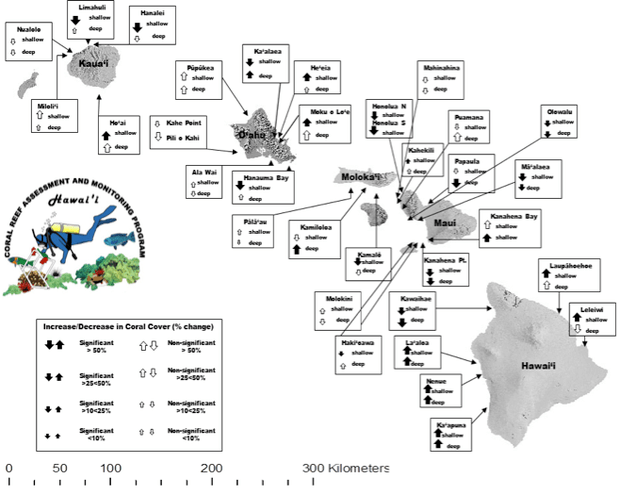 CRAMP is an integrated state-wide program with a common data base and rapid information dissemination system that provides the means for managers and researchers to detect and respond appropriately to environmental threats on Hawaiian reefs. I am currently working with Dr. Kuʻulei Rodgers at CRAMP sites throughout the Hawaiian Islands to gain a better understanding of ridge to reef connections and how humans will shape future reefs. The largest sheltered body of water in the main Hawaiian Islands, Kāne‘ohe Bay, contains among the highest coral cover in the State with numerous patch reefs, a fringing reef, and a barrier reef. This intensively studied estuarine coral reef ecosystem has been impacted by humans for over 700 years. Here we present the impact of the three recorded bleaching events in Hawaiʻi (1996, 2014, and 2015) on the resiliency of the Kāne‘ohe Bay reef ecosystem. I am currently working with Dr. Ku'ulei Rodgers, the Coral Reef Assessment and Monitoring Program, Division of Aquatic Resources, The Nature Conversancy, USGS, and the community groups to understand how watershed restoration influence the resiliency and susceptibility the adjacent coral reef environment in our changing climate.